When Ariel and her husband moved into their current home, the office walls were a bland flesh color that didn't spark much creativity - but just wait until you see what it looks like now that Ariel has gotten her hands on it. I'll give you a hint... you'll be green with envy once you see it! Click through to read all about the makeover process. I'm not sure about the healing power of crystals, but I am sure enchanted by their beauty. 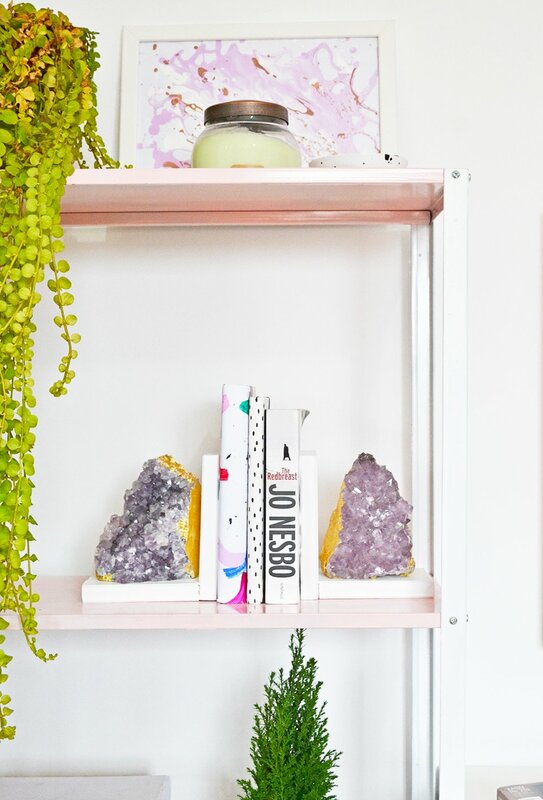 Thanks to their weight, these shining amethyst crystals are a natural fit for great bookends. Purchased from a high-end boutique, you're in for $300+ for a pair. But crafted at home, you can make a beautiful set for around $50, and a couple hours of your time. Add them to your shelf, or wrap them up as a holiday gift. Either way, they'll bring some serious style to any bookshelf.